The central conceit of Deep Secret is of a multiverse made up of a great Empire in its last days. Contemporary Earth is only one of hundreds of worlds that are members of this Empire, with two Magids who act as guardians and representatives for the planet. One of these is Rupert Venables, and the other is his mentor Stan. In the first pages of the book, the Emperor is assassinated and Stan dies of old age. In short order Rupert has to find a second Magid for Earth and locate the Emperor’s successor. Using his magic, Rupert arranges for the unknowing candidates for Earth’s new Magid to appear locally at the nearest convenient location, a hotel which happens to be hosting a science fiction convention. Thus oddities such as galloping alien centaurs and a number of oddly dressed people barely raise eyebrows, and indeed often illicit compliments on supposed cosplay. Jones plays fast and loose with all the genre conventions of space opera, children’s fantasy, and murder mystery to create a nearly anarchic novel of comedy and possibility. There is a lot to enjoy here. The portrayal of the small, book-centered science fiction convention (that seems to be a dying breed nowadays) is so accurate and vivid that I spent quite a lot of time wishing we could spend more time with those characters. This was my first time reading the book, which made me rather sad because I kept thinking of Jo Walton’s Among Others; it’s an unfair comparison since Walton’s is the more recent novel, though given its setting in the early ‘80s it feels more like a predecessor to this one. 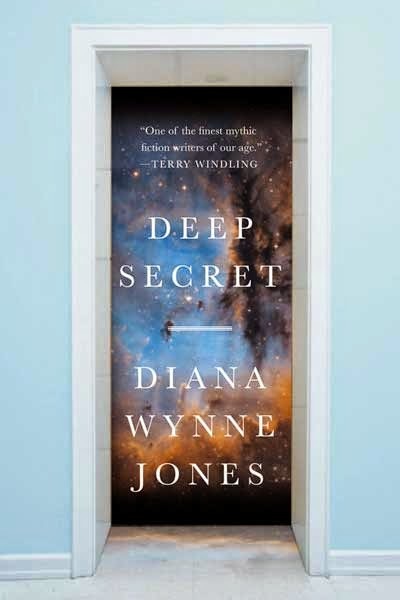 Deep Secret also feels outdated in other ways, including the references to faxes and floppy disks—you know, those things we had before email and clouds—and I was relieved that the characters’ discussions of video games mentioned no titles while saddened that their discussions of books largely referenced only fictional authors and their works. Another of the weaknesses of the book is also its strength: there are great swathes in which characters are off-page altogether doing other (to me, more interesting) things, and those doings are relayed in dialogue to the other characters only after the fact. It gave the impression of adults carrying on while the children are off in the wardrobe, as it were—which is an interesting and fun idea, but rather less fun to read about. I wanted badly to know what certain characters made of worlds where centaurs bounded and wishes came true, but those perspectives were withheld. Rupert Venables is a dry, amusing figure as essentially a low level magical bureaucrat, but the narrative only seemed to really get going when told from the perspective of Maree, one of the candidates for Magid, a down-on-her-luck student and genre fan. Unfortunately, too little of her story is told through her eyes and instead we get more of Rupert, who is at first annoyed by Maree, then bemused, and finally won over by her. There are a number of small, lovely bits in the book. For instance, Maree’s Aunt Janine is a small antagonist who quickly looms large, and the descriptions of her magics as thorns and vines that fill Maree with feelings of sadness and humiliation are utterly spot-on as metaphors for familial abuse and depression. A tangent about a pair of baby birds that wander to another world and come back grown large and intelligent—because they wished to be cleverer—is left dangling. Maree’s discussions with her Uncle Ted, a horror novelist, about writing as a job, characterized by his tendency to label additions to his house after the novels which purchased them, cross into that fuzzy area of satire that seems too real. In the past, I’ve had trouble getting certain friends to try reading Jones’s books; some people just can’t be persuaded that children’s books can still be great, even when read as adults. I opened this review talking about the new jacket cover and its abstractness—just the sort that can be used to lull some unsuspecting readers into picking up something new that they otherwise wouldn’t. I’d like to add Deep Secret to that list of books that can be used for these purposes, because by the time they realize what you’re up to, it’ll be too late, and they’ll be in too deep.